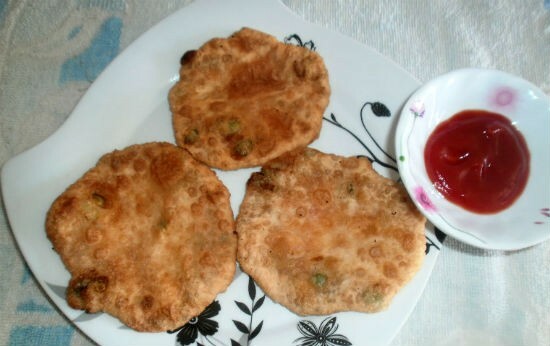 A delicious and tasty variation to the regular puris, this Peas Puri (Matar ki Puri/Green Peas Stuffed Poori) is easy to make and is quite popular in Uttar Pradesh. 1. Grind the peas to a coarse paste. 2. Mix the maida, rava, salt and oil in a bowl. 4. Heat little oil in a frying pan over medium flame. 5. Add the ground peas and saute for 2 to 3 minutes. 6. Add sugar, turmeric powder, red chilli powder, salt, cumin powder and coriander powder. 7. Stir well and cook for 2 to 3 minutes or until the raw smell disappears. 9. Make small balls of the dough and shape them into a cup. 10. Add some of the peas mixture and roll it out into a medium puri. 11. Heat oil in a deep frying pan. 12. Fry the prepared puris till golden brown and crisp. 13. Remove and serve with side dish of choice. Feel free to comment or share your thoughts on this Peas Puri (Matar ki Puri) Recipe from Awesome Cuisine.